Frenchman Stephane Holweck started his music career in 1976, when he joined Hungarian Peter Ogi (O.G.I.) as bass player. OGI signed a deal with Malcolm McLaren, so they moved to London, UK. In the early 80's, he played with several South London rock bands, and started jamming with Youth who had just left Killing Joke, and they formed their own group called Brilliant. They both played the bass and were boosted by the drumming of Big Paul. The group recorded various singles and got charted in the independent charts. They were also joined by Jimmy Cauty, who lived in the same house as Stephane. Ben Watkins joined them in 1983 to play keyboards on a tour. In 1984, Stephane created another band called Fresh, with Brandon Beal and Muff O'Donnell. In 1985 they recorded Bobby's Boys "Bobby Can't Dance". An electro single which involved Robert De Niro and Martin Scorsese. They went to New York to record an album, but the collaboration stopped when the record company closed down. Slowly Stef slowed down his work relationship with Ben, but he was still participating on the albums Beyond The Infinite, Bible Of Dreams and Shango. In the meantime, to escape the intensity of working with Juno Reactor, Stef linked up with Serge Souque in Paris at a TBE party on the famous Delo Barge. They wrote two tracks and recorded them in Youth's Butterfly Studios under the name Total Eclipse. Soon after, Loic Vanpoucke joined the band. From there they built their studio in Serge’s hometown Bordeaux. 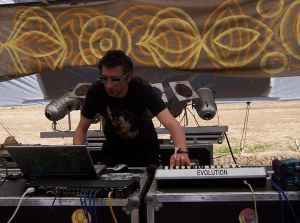 This project was very successful and Stephane has continued Total Eclipse as a solo effort since around 2005.